After having worked with two other local florists for several years, Fifth Generation Texan, Donna Smith, noticed a common trait emerging from many of the repeat clientele. They wanted an ‘out of the ordinary’ approach to floral décor and event composition. In 1991, Donna opened Out of the Garden to fill that need and began servicing hotels, businesses and private homes with her unique style of floral design. Donna’s unconventional ability to create the unusual, quickly catapulted Out of the Garden’s popularity amidst the community to what is now recognized as one of the premier companies in floral artistry in all of North Texas. Donna considers her dedicated staff to be her most valuable asset. “We invest in our people, in their education, their motivations and their capabilities. Our designs come from exceptionally creative individuals, inspired by our resplendent quality of product selections, which come from all over the world”. Out of the Garden’s success has resulted in Donna contributing her talents to such highly esteemed events as President George W. Bush’s Inaugural Ball, ‘Black Tie & Boot’s’ Gala. 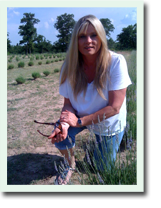 When away from ‘the garden’, Donna takes pleasure in working with her husband Mark at ‘Timber Rock Ranch’, their Lavender Farm in Bowie, Texas. There, she gains inspiration and rejuvenation from spending quality time with her beloved Texas Longhorns-- Bubba, Jenny and Hannabelle and Donkey’s-- Bella and Beau.